The project relies on cheap, commonly available LED strip lights. Rather than any fancy addressable strips, these are just simple strings of LEDs with current limiting resistors already fitted in a convenient, adhesive backed format. This makes the job as easy as peeling off the backing tape, sticking the strips to the helmet, and providing a power source. In clsasic entry-level hack style, everything’s running off a single 9V battery. Is it as versatile as a rechargable lithium pack with integrated controller? No, but it’s a swift way to get a project off the ground. The trick here isn’t so much the hardware side of things – there’s nothing fancy about a battery and some LEDs. The key here is that [Patrick] identified that his children are small and difficult to see, thus it made sense to fit helmet lights rather then more typical bike lights to make them more visible to surrounding traffic. For something at the other end of the spectrum, check out this amazingly professional LED bike light. It was not too long ago that all PCB design packages were proprietary. Getting PCBs made was expensive, and if you tried to do this over the Internet, the best way was to download a board house’s proprietary software, design your board in their software suite, and send your boards off to be made. A 5 cm square board would cost two hundred dollars. I know this to be true because I’ve said it before, and no one has corrected me. 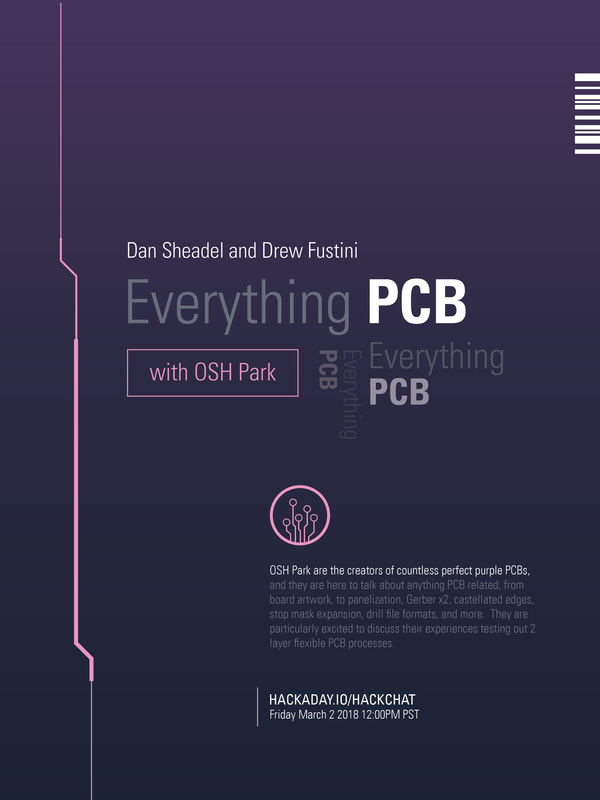 For this week’s Hack Chat, we’re talking Everything PCB with OSH Park. OSH Park is the leading creators of perfect purple PCBs. They have POGs, and for the last two weeks, they’ve been one of the few places you can send some Gerbers to and have it manufactured in a timely manner if you live in the US. Because China was closed.